Two million years ago, a steady wind blew in this corner of the earth, carrying with it tiny bits of limestone. Slowly, over time, these deposits accumulated to create an immense plateau of rock. There was no dramatic explosion of a thunderous volcano here, no violent upheaval of land. Just the constant, warm breeze persistently constructing a firm foundation of stone. Eventually, the incessant motion of the sea began assert itself and cut through the low expanse of land. The unrelenting waves carved deep chasms, separating the Bahamas into four shallow banks. Each is dotted with islands and cays, both big and small there are over 700 in all. A long time later, more steady growth, this time by tiny aquatic organisms. Little by little, miniscule marine polyps colonized to form the coral reefs that abound in the shallow, warm seas of the Bahamas. Life today in this beautiful land is much the same: steady, slow, calm. The persistent trade winds flow from the southeast, punctuated by occasional storms and squalls. The temperature stays well between 70 and 90 degrees all year long. But the sea has remained relentless in its effect, with its potent power a persistent fear. Many of these islands are uninhabited, some virtually unreachable even by boat due to their shallow and rocky shores. Development has been slow, with some out-islands getting electricity for the first time in the 1990s, and resorts seemingly holding great promise years ago now in ruins. Life's pace here is far from the frenetic career-driven pace many of us live. In many places, the mail boat comes just once a week, delivering everything from groceries to people to cars, building supplies, backhoes, and - oh yes - mail. descriptive designations. South Dog Rock on the charts is known to the locals as Ocean Rock or Jimmy Knowles. There is Narrow Water Cay, The Whale Tail, Cistern Cay, The Rocky Dundas, Square Rock Cay, London Gin Rock, Danger Reef, and Lobster No-Lobster Reef (right next to Close Mon reef!) to name a few. Cruising much of the Exumas is like camping - just you (and maybe a few others) enjoying the outdoors without much or any development nearby. 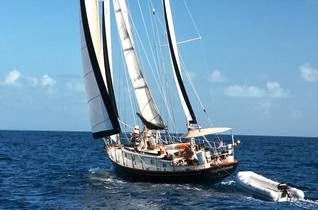 We stocked up on fresh food, water, and fuel in Nassau before heading off to make our Exuma landfall at Allan’s Cay. 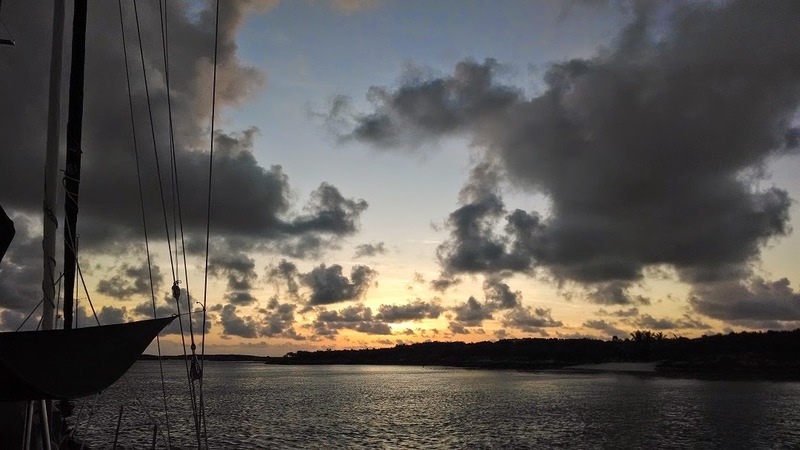 We anchored in the small area surrounded by a group of three islands - long & thin Allan’s Cay to the west, Leaf Cay to the east, and crescent-shaped Southwest Allan’s Cay to the south. Leaf Cay is known for its famous inhabitants - the Rock Iguanas. 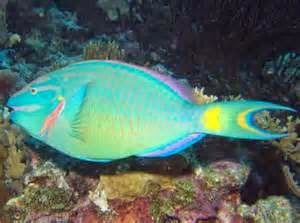 These creatures exist nowhere else on earth (except for a few on Southwest Allan’s Cay). 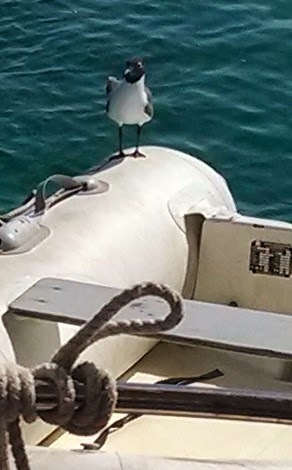 These creatures are trained to greet those who come ashore, as tour groups frequent this beach and feed them to guarantee a good show for their patrons. This reptiles most remarkable feature is their pineal eye, a third eye that sits just under the skin with a well-developed lens and retna. The function of this eye is not well understood, but some scientists believe it is to tell day length, which plays a role in their reproductive cycle. They were not particularly friendly to us, but they did come out to the beach to see what we had to offer. 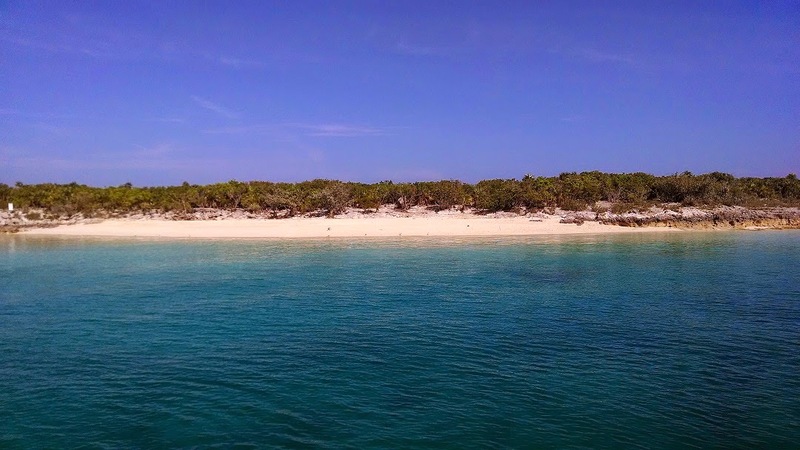 We found reefs to snorkel along the western shore of Allan’s Cay, on the southern shore of Leaf Cay, and past the northern tip of Leaf Cay. It is important to time dives here to coincide with slack tide, as the current can rip through these areas at a wicked pace. We found some well-developed reefs with fascinating and exciting life below the sea: spotfin butterfly fish, fairy basslets, stoplight parrotfish, blueheads, French grunts, and slippery dicks (no, not kidding), among others. Cockpit dinners at sunset topped off days of fun undersea. 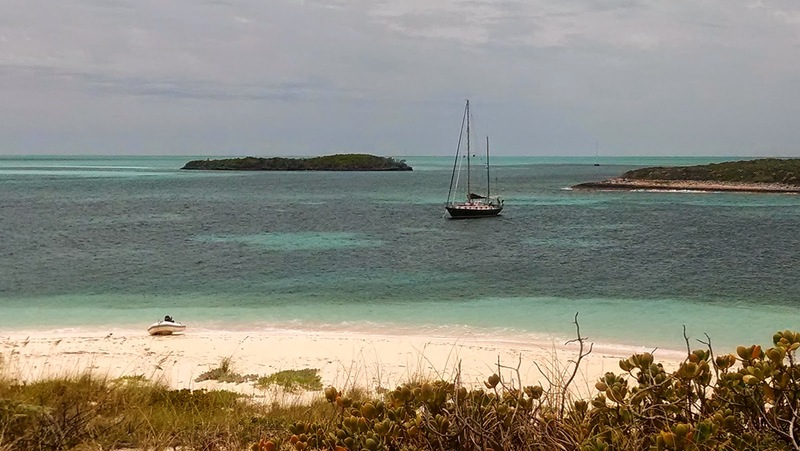 The three days at Allan’s Cay were a marvelous start to our time in the Exumas. I have been waiting for an update! Exuma's look awesome. I am so jealous!